On Thursday, June 7th, we offered our third Create a Commuter workshop to the Immigrant and Refugee Community Organization (IRCO). IRCO is the leading refugee organization in Oregon and Southwest Washington, empowering refugees and immigrants to become self-sufficient, long-term contributors to the economic vitality of the community. We had 20 immigrant and refugee adults arrive at the IRCO gym early on a very rainy day in June. This space was wonderful as it was large enough for the participants to test ride their new bikes indoors. We were able to bring the TriMet rack into the gym to practice putting bikes on the bus while we waited for the rain storm to pass. After it cleared, we went out on a short neighborhood test ride. 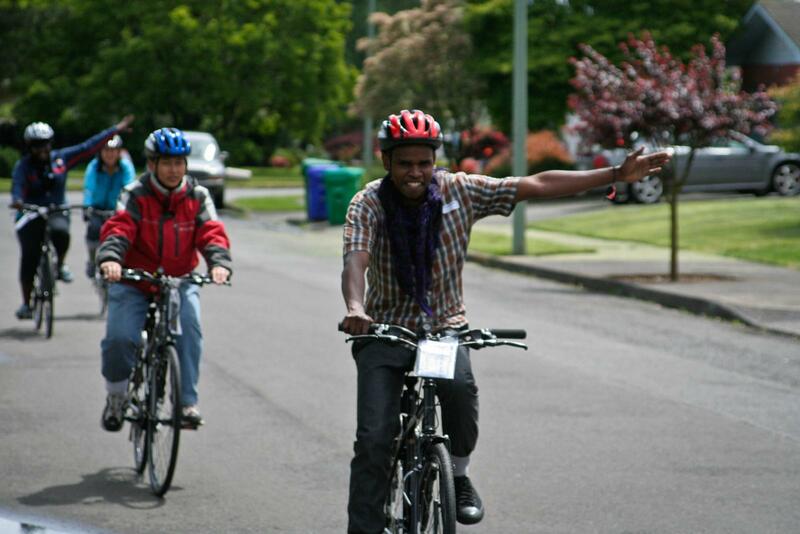 Everyone did great, even though many had never been on a bicycle in the USA, where the laws are very different than in their home countries of Nepal, Burma, Somalia and others. The workshop was translated into several languages as needed, with the help of interpreters. We had to teach a few sentences at a time, then pause for translation. It was great to see all of the participants engaged and asking questions, despite the language barriers. After the shifting, handling and rules of the road lessons, we embarked as a large group on our longer ride to the Gateway Fred Meyer and transit center. 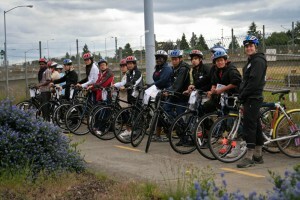 We managed to avoid another storm and practiced crossing busy intersections, Max tracks and riding on the I-205 bike path. On our way back to IRCO we were stopped at the Max tracks. While waiting for the train to depart, we saw a Create a Commuter participant from a previous workshop disembark with her bike and start riding towards our group. I excitedly said hello and she was so thrilled to see us with another group of new bicyclists. She mentioned that she was riding her bike to work, and off she went with a huge smile on her face. It was perfect timing to see another Create a Commuter bike in use! 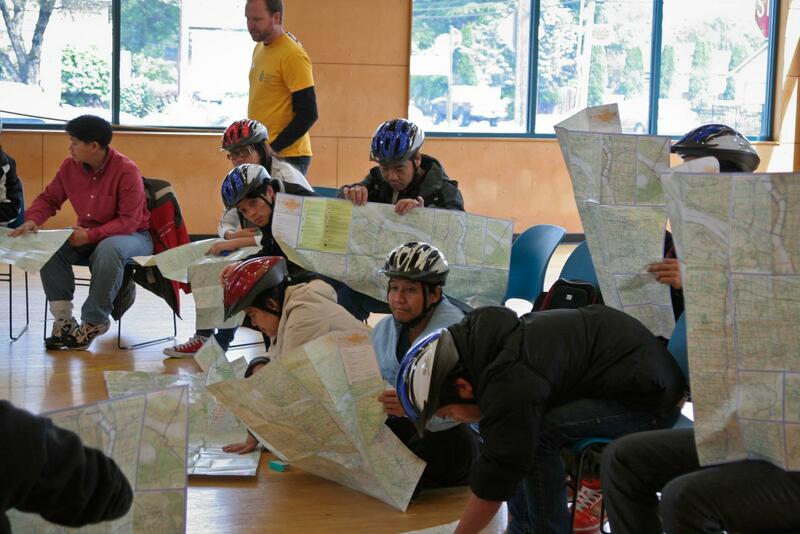 We ended the day with some flat tire repair and route planning lessons, and many participants had their portraits taken with their new bicycles by our volunteer photographer, Dan Sloan. Thank you to IRCO for such a successful workshop, and to all of the volunteers who made this workshop possible. To see more photos from this workshop click here.